The coastal fringes provide a wide range of edible sea vegetables that have been harvested for centuries. 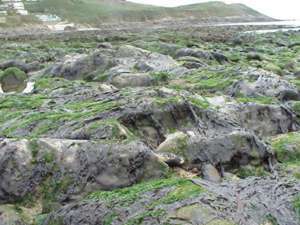 Many species of seaweed grow across the intertidal zone and below low water, from the Arctic to North Africa and other similar latitudes. The edible types can be roughly categorised into the finer weeds as laver and sea lettuce, the short stemmed as dulse, Irish moss or carragheen, and “horse-tail” kelps that grow on or below the low tide mark. Laver (porphyra umbilcalis) is shiny black lying flat on rocks with long flowing fronds under water. Of all seaweed laver is unique, being only one cell in thickness, I becomes very palatable when cooked. It is made into Nori in Japan and Laverbread in Wales. Considering that nine billion sheets of nori are consumed annually, mostly in sushi, the other seaweeds are of far less importance. Laverbread in some form as been eaten in Britain for centuries, probably as a survival food. The first known record of it was in Camden’s Britannica in 1607. There is vividly described the springtime gathering of “Lhawvan” from the beach of Eglwys Abernon near St David’s in Pembrokeshire. In 1797 it was reported that earthenware jars of pickled porphyra were exported from Watchet in Somerset. During the mining era in the eighteenth century, “lawr” became a staple food of the pit workers as part of breakfast. In 1865 George Borrow on his travels wrote of “moor mutton with piping hot laver sauce”, a great dish of the time. Though consumption of Laverbread has declined, as has the mining community, and the popularity of the cooked breakfast, it is still eaten throughout South Wales. Restaurants, however are increasingly serving it in other ways to accompany seafood and vegetarian dishes.